As the lead singer from Men at Work, Colin Hay was the man who famously rhymed ‘language’ with ‘Vegemite sandwich’ on the hit song ‘Down Under’, way back in 1983. If that seems an odd thing to remember then please forgive me, I was six years old at the time; rhymes were almost as important to me as sandwich fillings and this one I hadn’t even heard of. Working as a solo artist since 1987, Hay has released a steady stream of well-received records and Fierce Mercy will be his thirteenth of that thirty-year period. It’s therefore no surprise that themes of age, memory and the passing of time course through the album. But far from being maudlin, Fierce Mercy is joyful, philosophical and full of life-affirming hope. Scottish-born Hay moved to Australia at the age of fourteen but moved to California in the mid ‘80s and has lived there ever since. Fierce Mercy was tracked in Los Angeles with Hay’s usual band and additional recording and mixing took place in Nashville, so there’s a perfect union of west coast laid-back attitude with that Tennessee slickness and sugar. Cue the driving rhythm and steel guitar of opener ‘Come Tumbling Down’, which is instantly rousing in a Jackson Browne kind of a way. The feelgood factor is turned up to eleven as the legendary Alison Brown (co-founder of the Compass label) steps in to contribute some dazzling banjo at the song’s outro. So, barely four minutes into the album I’m tapping my feet and in my imagination I have my cowboy boots and shades on, the top down and I’m ready for the road trip. That is, of course, until track two scoops me up and away, like some kind of giant eagle, and transports me to a whole different world. Line by heartfelt line the impossibly epic, ever-ascending melody of ‘Secret Love’ builds to its inevitable climax: an explosion of passionate, soaring strings and waves of crashing drums. If I wasn’t so busy blubbing several bathfuls of tears I’d have the composure to notice how old-school the songwriting is here - there’s more than just a whiff of Phil Spector in its construction. The production is likewise, pure 1960s high camp and reminded me very much of Elvis Costello’s work with Burt Bacharach. The lush string section on the ethereal ‘A Thousand Million Reasons’ (the record’s lead single) is equally cinematic but the song is, by sharp contrast, more dream-like and serene. It’s a levity-inducing song of love, devotion and security; I found it beguiling and otherworldly and that was even before the strings fully kicked in. Let’s just say the eagle set me down gently somewhere in the heavens and then we can put my hastily-employed metaphor from earlier on to bed... In any case, with just three songs, Colin Hay proves that, musically, he can turn on the proverbial dime and there is definitely much more to this particular sandwich than a sticky yeast extract. The power and diversity of the trio of opening tracks makes the rest of the album seem pedestrian in comparison but, that said, there are still little gems to be mined from the remainder of the songs. ‘The Best In Me’ feels a little like Mark Knopfler in its simplicity, as does ‘Frozen Fields of Snow’ - a tale of a war veteran returning home - which is full of Bruce Hornsby-esque piano. With a catchy, gospel-flavoured chorus, ‘The Last To Know’ lays out the idea of the record’s title: Fierce Mercy, as it details the ways in which life can throw us little warning signs when we need to slow down, take notice or seize the day. Elsewhere, the reggae guitar and rap of ‘I’m Walking Here’ is the album’s definite Marmite moment but the final two tracks show Hay at his absolute best, writing from the heart. The poignant ‘Two Friends’ captures the helplessness of grief and the journey of mourning and ‘She Was the Love of Mine’ is a heartbreaking yet uplifting tribute to Hay’s mother who passed away three years ago. 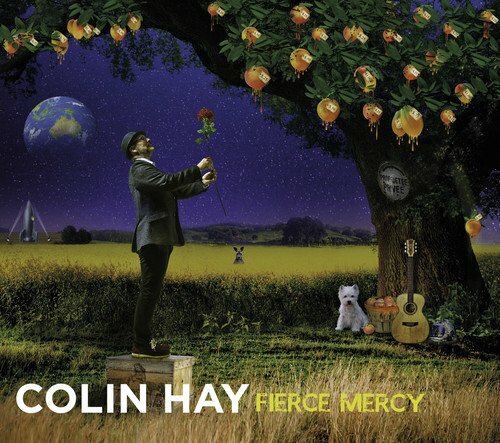 It’s a fine end to a great collection of songs and it leaves me thinking there’s a lot more I need to discover about Colin Hay, the man who’s been singing that hit song in my head for the past thirty-four years.